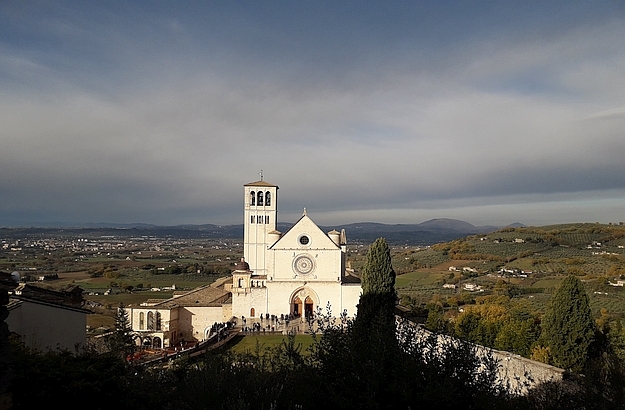 A view of the Basilica Saint Francis and the surrounding countryside. 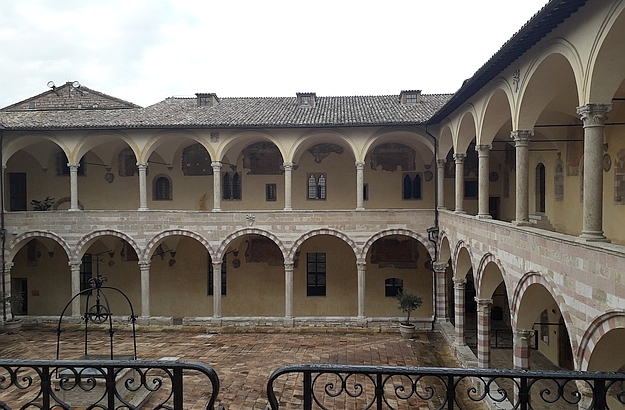 The cloister is seen here from the Lower Church of the Basilica. 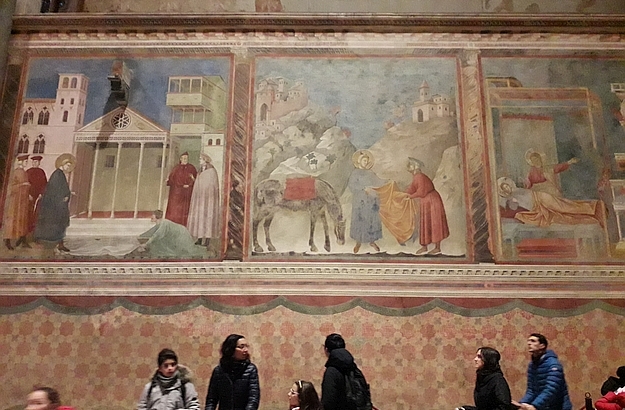 The frescoes in the Upper Church depict Saint Francis’ life. Located in the historic town center, Rebecca’s apartment offers a splendid view. In the Museo della Memoria: the presses and tools used to save the persecuted Jews. The long stairway leading to the main entrance of the Basilica Saint Francis. But before meeting up with her for our lunch, I absolutely wanted to see again, after a ten year abstinence, the magnificent frescoes adorning the upper and lower churches of the Basilica of Saint Francis – exquisite works of art executed by a number of medieval painters: Giotto, Cimabue, Pietro Lorenzetti, Simone Martini, among others. I had chosen an ideal time for my visit: mid-morning, on a weekday, in winter. Do the same if you can, as the Basilica can get very crowded on weekends, even in the cold season. After marvelling at the frescoes for close to two hours, I had a hot chocolate at the beautiful Bar San Francesco right opposite the cathedral. Then I went to have lunch with my friend Rebecca. 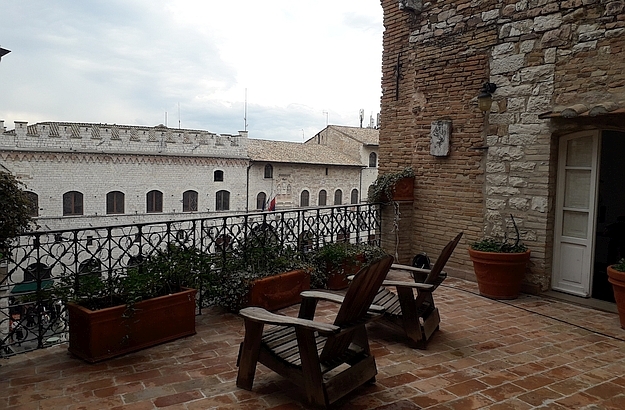 During our relaxed conversation, Rebecca told me about the Museo della Memoria, a small museum which I had no idea existed in Assisi, and which she strongly advised me to visit – and I understood why she insisted when I discovered it in the afternoon. 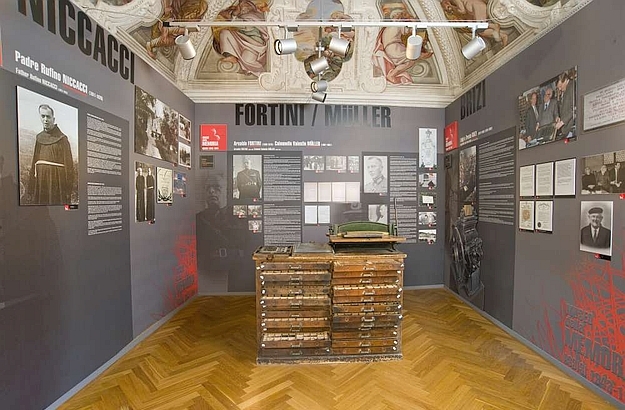 This museum exhibits the printing press and tools that were used by Luigi and Trento Brizi in 1943 and 1944 to print high-quality fake ID documents for Italian and European Jews who were hiding in Assisi. I found out, during my visit, that a large number of typesetters, monks, clergymen and private citizens worked in secrecy to try and save from deportation the persecuted innocents. I left the Museo della Memoria deeply shaken. 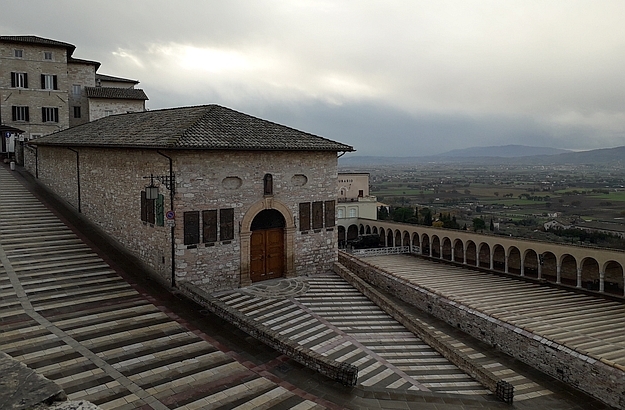 At the same time, I was thankful to have found an inspiring example of people who, during some of Europe’s darkest times, had made sure to put into practice the altruistic teachings of Italy’s heavenly protector, Saint Francis of Assisi.